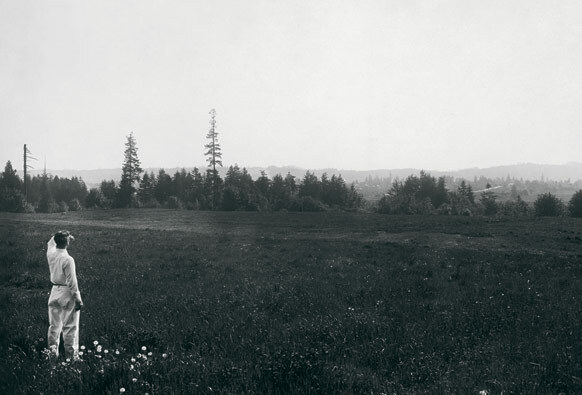 President William Trufant Foster looking out towards the west hills of Portland, 1910. This fall, the college celebrated the hundredth anniversary of a momentous event—the first time a Reed student squirmed in a chair as the argument that seemed perfectly sound two minutes ago was torn to shreds by classmates. Welcome to your freshman year. Plus ça change. Sifting through accounts of the college’s history in preparation for this issue of Reed, I have been struck by one particular theme—perseverance in the face of overwhelming odds. The college was nearly strangled before it ever drew breath, stymied by relatives who were aghast at being cut out of Amanda Reed’s will. The collapse of the property bubble in the 1910s wrought havoc with its endowment. It emerged from World War I hanging by a thread. Then came the Great Depression. World War II. McCarthyism. And the Sixties. Each of these historical events posed monumental challenges. Yet somehow Reed survived—and flourished. I do not think this happened by dumb luck. It took vision, sacrifice, guts, and grit from the people who loved the college and the ideals for which it stood. The story of Reed is far too long, interesting, and controversial to be conveyed in a single magazine, but we decided to do it anyway. 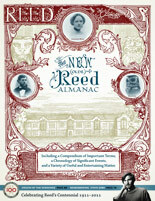 In this issue, we proudly present an ambitious, but irreverent, Reed Almanac, in which we attempt to shoehorn key elements of the college’s history into absurdly telescoped entries. Of course, an undertaking of this nature is liable to be fraught with omissions, elisions, and outright howlers. To remedy this, (and in homage to Wikipedia cofounder Larry Sanger ’93) we invite readers to add to the Open Almanac on our website. In this issue, we have sought to bring the aspirations of those early days to life, and to pay tribute to the light that shone on that fateful morning.